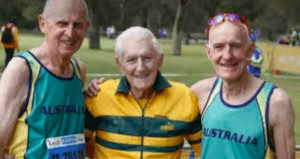 It is with great sadness that we record the death on 1 August 2018 of one of World Masters Athletics most courageous, successful and truly remarkable athletes – the much loved Australian distance runner John Gilmour, Patron of Masters Athletics WA, who died in his adopted city of Perth whilst undergoing surgery, aged 99. The World Masters Athletics Council and Masters athletes from all over the world who knew John, offer their sincere condolences to his family. A full tribute to this extraordinary runner will be published later.